When President Obama’s 2010 State of the Union address called for 100,000 excellent STEM (Science, Technology, Engineering and Math) teachers in 10 years, Talia Milgrom-Elcott was the one to personally respond to the charge. Through 100Kin10 this goal is becoming a reality, with more than 250 organizations from across sectors coming together in an unprecedented movement and breaking the mold for how organizations collaborate. Can you please describe your professional journey and how you transitioned from a career in law to one in philanthropy? I went to law school with the idea that the law was a tool for addressing the major social challenges of our time. I soon came to realize that by the time a lawyer or a court saw a problem it was already full-blown. I wanted to get to the issues by dealing with the underlying causes. I determined that education and creating opportunity would solve a lot of social ills like poverty, violence and inequality. After I did a clerkship, I worked for the New York City Department of Education and then went to the Carnegie Corporation of New York where I focused on talent retention for teachers as part of their educational initiatives. So many people at the time thought that a new curriculum would solve most educational challenges. At Carnegie, we believed that a key factor was talent and getting better teachers into schools. How did you get involved in working on STEM (Science, Technology, Engineering and Math)? All of the same challenges that the educational system faces are exaggerated and more acute among the STEM subjects. So we began to focus on STEM teachers. 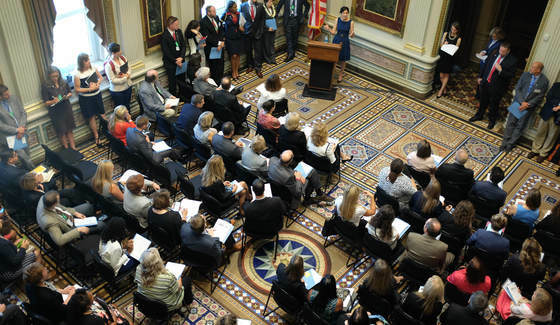 Against that backdrop, in 2010 the President put out a call for 10,000 excellent STEM teachers in two years in order for the U.S. to stay competitive with other countries around the world. [President Obama later expanded that goal to 100,000 excellent STEM teachers in 10 years]. We were perfectly positioned to take this on at Carnegie with our work on teacher retention, most recently specializing in STEM. We joined forces with organizational partners because not one organization could tackle this alone. By 2013 it became increasingly clear that this project couldn’t be a side effort at Carnegie so we spun out as 100Kin10. What has the progress been with 100Kin10? Our partners recruited and prepared 20,000 teachers in the first 3 years. By the end of this summer, which marks five years since President Obama’s call for action, we’ll have brought on a total of 40,000 teachers. Additionally, our partners made their full pledges for the next five years and by 2021 we are on track to exceed our goal of 100K. What is the distribution across states? Which states are leading and which states are lagging? We’re planning to reach 100Kin10 but it’s definitely skewed geographically. There are hot spots in urban centers such as the coasts, Denver, Texas, and Arizona. But the Southeast and Northwest are sparse. A lot of rural America is sparse as well as the mountain regions. We understand that there are gaps where this network is not serving communities. We need to grow or come up with new approaches to not only provide 100K teachers in total, but to also ensure that all classrooms have access to great teachers, which is the underlying goal of this whole project. One of the challenges you’ve outlined is that it’s not prestigious for undergraduates to become STEM teachers, especially when they could earn a higher salary in other fields. For example, a student studying engineering would be more incentivized to work for Microsoft than to become an elementary school teacher. How are you enticing young people to become teachers? First, it’s important to understand that 100Kin10 is a network and we act as a hub to inspire organizations to take on this challenge. We support them to be successful, while also accelerating and amplifying their efforts. We’re not doing the actual work, but we’re catalyzing the work and helping others do this work. The way we’re approaching this is not through a silver bullet, it’s not a one-size-fits-all response. We’re creating fertile ground for our partners to problem solve. One thing we did to address this was 100Kin10 created a day of learning for its organizational partners and brought together experts in marketing, media, communications and branding. Together they designed an innovative campaign called Blow Minds. Teach STEM. Another example from one of our partners is when Public Impact, a think tank in North Carolina, created Opportunity Culture. This program gives top teachers with track records the opportunity for growth and the ability to reach more kids. They can be master teachers overseeing multiple classrooms or they can have the ability to mentor other teachers. Schools in this district have trouble staffing all of their classes with qualified teachers so they came up with a new solution. Consequently, these teachers are paid more since they are freeing up resources by taking on more work. What is your relationship with the White House since picking up the President’s charge? 100Kin10 originated as a private sector response to the President’s call for action.We met with U.S. Secretary of Education Arne Duncan four months after starting and much later we had an event at the White House with our partners. Since then it’s been a symbiotic relationship. The more work we do, the more the President speaks about this as a goal since it’s increasingly achievable. The more the President speaks about it, the more people want to get involved. The goal is 100,000 STEM teachers by 2021. What happens in 2021? (1) We end with a big check mark and publish a set of key studies and tools that tell our story. (2) The network becomes so useful for its partners that they want us to continue. We continue to expand our capacity for sharing resources, doing research and forming collaborations. (3) The idea of 100Kin10 becomes synonymous with an approach to problem solving. It’s a way to take up big systemic challenges that are not amenable to being responded to by individual organizations or agencies. These types of issues require multi-sector partnerships to tackle a shared goal. We support different kinds of efforts to help others learn from what we have done and adapt it to their settings. We can help fuel their own innovative coalitions in order to solve large problems that they are facing. When I was in law school I counseled undergraduates about career choices, and even then I knew if you didn’t want to be a lawyer, law school probably was not the right choice. I wasn’t done learning formally and I wanted more skill. I thought of it as a generalist degree that I could take anywhere. But it really is a vocational pursuit and ultimately I didn’t want to be a lawyer. Growing up, my mom was a Rabbi and my family was egalitarian but we went to Orthodox schools. I felt like I didn’t belong. Being an outsider in the community was productively uncomfortable. It was liberating – you could do things differently. You could really observe others when you’re not one of them. But at home I was home and I was profoundly known. A first grader should understand that his or her culture isn’t a rational invention; that there are thousands of other cultures and they all work pretty well; that all cultures function on faith rather than truth; that there are lots of alternatives to our society. Cultural relativity is defensible and attractive. It’s also a source of hope. It means we don’t have to continue this way if we don’t like it. I’m optimistic that maybe the reason we haven’t solved some of the biggest challenges as a planet is that only a tiny portion of our population has the skills, know-how and empowerment to solve these challenges. But if we can unleash more brilliance, skill set, and diversity of experience then maybe we have a shot at solving them. We built something with 100Kin10 in which very diverse stakeholders come together, when they are often at opposite sides of the negotiating table, to be fellow travelers toward a shared goal. Our only chance of solving big challenges is with that approach at the core. We had a huge goal and everyone knew they couldn’t reach it alone so we had to find each other and come together. We created a space where people can trust each other and that’s an important element that made 100K possible. Dr. Rochelle Dicker is a Trauma Surgeon in San Francisco. She is the Director of the Wraparound Project, a hospital-based violence prevention program that has been replicated in other trauma centers. She has created a cutting-edge model for disrupting the perpetual cycle of violence in vulnerable communities. What inspired you to devote your life to helping others? Growing up, my family would watch the national news and then we would discuss what we just watched around the dinner table. Through these conversations, I was compelled to help the world in some way. On the weekends, I went with my dad to his job. He was the owner of a clothing manufacturing business. At 10 years old, I was taken by how hard new immigrants were working in my dad’s factory. They came in on the weekends because they wanted the over-time. They were doing everything possible to make life better for the next generation. I witnessed a lot of their struggles. They were incredibly kind whenever I visited. I thought at some point I would serve communities that were vulnerable. Why did you want to become a surgeon? I went to the University of Vermont for medical school. I did my surgical rotation in my third year and thought there was no way it would be a good fit. But after the first three weeks, I was hooked. It gave me the feeling that I could make people better right away. It provided instant gratification. The ability to change people’s lives was extraordinary. I then had to reconcile surgery with public health and my desire to serve communities. I always thought that surgery was about the individual and about expensive medicine – not about serving the masses. I struggled with this tension but when I became an intern I realized that surgery could be about vulnerable populations if you focus on injury. Those who are injured are mostly from vulnerable populations. What has been your experience as a woman working in surgery? When I was a resident, I definitely felt discrimination. In order to be treated equally you had to be better than the guys. Leaders in surgery were reluctant to have women in the field. It was hard to find mentors. Becoming a surgeon is a really long road and that deters many women who want families. We’re slowly shifting the tide – both in terms of the acceptance of women and also by understanding that it’s okay to have a life outside of medicine. Now that women are part of the leadership, there’s no turning back! Why did you found the Wraparound Project? When I was an intern I met a man who doubted he would live to 25 years old because he thought he’d be shot and killed. He came back twice in the same month with gunshot wounds and survived both surgeries. I did a violence prevention fellowship and learned that there are risk factors and preventative measures in violent injury. Just like there are risk factors to heart attacks such as diabetes, poor diet, and lack of exercise that make you susceptible, the same is true for violence. The risk factors are socioeconomics, poor education, poor opportunities for jobs, unsafe neighborhoods, drugs, dysfunctional family units, etc. But there are conditions that are reversible, which can reduce the risk of violence. I started the Wraparound Project and hired a case manager who had a deep understanding of urban violence. He, himself, came from a vulnerable community. Because of his background he was able to go to patients’ bedsides and create an incredible bond. What resources does Wraparound provide to injured patients? We provide a risk assessment and needs assessment based on the individual’s profile. We offer a long-term case management plan where people are shepherded through risk reduction resources. We try to create protective factors and opportunities like helping them go back to school and find jobs. Some individuals need to first address a mental health disorder before they apply to school. What has been the progress of Wraparound to date? Today Wraparound has served over 600 people and the re-injury rate has been cut in half. We have four case managers. Right now we are interested in creating an internship program because a lot of clients who have been served by Wraparound want to become case managers. What is challenging about working with vulnerable communities? There are extraordinary challenges. The case managers often represent the first people in our clients’ lives that believe in them. The clients have a hard time trusting. They’ve never had structure or discipline and they’re stuck in a desperate situation, often without any resources. We’re trying to help them create a safer life for themselves. They think in terms of the day-to-day and we’re trying to shift their perspective to think in the long-term. They didn’t grow up believing that if they work hard, over time they can achieve their goal. What are your short-term and long-term goals for Wraparound? My short-term goals are to create the internship program and hire a clinical psychologist on staff. Mental healthcare is essential for our clients. My long-term goal is to expand the program to serve the older population in San Francisco. People in their 40s and 50s who get injured have a different set of needs from the younger population. I want to provide case management services for them. They’re typically homeless and have severe mental health issues such as schizophrenia. If we had a program specifically for them, we could make real headway. In November I’m going to the Panamerican Trauma Conference in Brazil and I have an opportunity to do a workshop for hospitals in Central and South America. I will teach them how to set up a hospital-based violence intervention program. I’ve spoken in the U.K. and I’m also helping a few programs across the U.S. So the expansion of this model is a long-term goal. We want to incorporate these programs into the fabric of trauma centers nationally. We’re working with the Law Center to Prevent Gun Violence, which is an organization comprised of lawyers who are interested in the cause. We’re figuring out a way for case managers to be paid as healthcare providers. There’s a coalition of 30 programs like ours called The National Network for Hospital-based Violence Prevention Programs. We work on this as a big group so we can come up with a sustainable solution instead of having to fundraise every year. I’m proud that medical students and residents today see that surgery has a gentle side. Programs like Wraparound acknowledge that surgery is not all about genotypes and phenotypes. A lot of risks that go into someone needing a surgical procedure are based on the fact that there are social determinants of health. And those are as important as genetics. My parents never pushed anything down my throat, but daily there was an underlying feeling that you’re supposed to serve your community. It’s spiritual, it’s religious, it’s familial. I want my legacy to be about establishing an even playing field and acknowledging that a community, state, or country can’t be healthy unless our most vulnerable people are cared for. Anat Lechner is a Professor of Management and Organizations at NYU Stern School of Business. She is also an entrepreneur specializing in the intersection of business and color, leading the color management industry. Forward Females had the privilege of sitting down and interviewing this revolutionary thinker and innovator. How did you know what you wanted to do professionally? It evolved. I partially led it and it led me. Over the years, I learned to accept this duality. You need to be able to take both the front seat and the backseat. Sometimes you lead and are deliberate, but sometimes you trust the ride. When I was 12 years old, I had to tell my class what I wanted to be when I grew up. I wanted to be a psychologist. I knew I wanted to marry a tall man with curls, and I did exactly that. I always wanted to do something impactful. And I knew that I wanted to be free. That was very important to me. I don’t follow routines, norms, and hierarchies. And that is still my ideal self. I haven’t changed at all since I was 12 and I’m now 52. How did growing up in Israel affect you? When I grew up in Tel-Aviv, I was young in a country that was young. The country was 15 years old when I was born. I was inhaling entrepreneurship from day one. By the time I was 20, I had been through three wars. I learned to live in uncertainty. And in the moment I learned to have fun, without caring too much about tomorrow. But in Israel we also lived with a lot of meaning and vision. I became an officer in the Israeli army because I had no desire to report to anybody. So I found a way for others to report to me. That’s always been my way of dealing with hierarchy. I can’t stand it. After the army, I travelled to Europe. I backpacked for half a year. It was before the Internet and cellphones so it was easy to get lost and nobody could track me down. My mother soon discovered that this lifestyle suited me very well. When did your vagabond lifestyle come to an end? My mother convinced me that it was time to go to college so I applied for a Bachelors degree in Psychology, but I didn’t get in. I then applied to specialize in Social Work, which I thought was the closest thing to Psychology. My first job after college was with alcoholics. It was difficult work and I didn’t see the kind of impact that I wanted. I didn’t have the perspective to say to myself that it takes time to see real results. When you’re in your 20s, your understanding of how fast something should happen is so skewed and immature. It’s not substantiated in anything but your ambition. You end up judging things and you’re really wrong. What did you learn from working with alcoholics? I realized that I’m good at finding systemic solutions that are relevant to groups of people. When I decided to study Social Work, I didn’t know that most of the work is done one-on-one. I enjoyed working with groups of people rather than with individuals. I organized support groups for children of alcoholics and did group therapy solutions. Through that work, I understood that I’m a macro-level thinker. What did you do after you left your job working with alcoholics? I then enrolled in an MBA program. While I was in business school, my father lost all of our family’s money down to the last penny. I came from an affluent family so everyone was totally shocked. At that same time, my husband was rejected from a Bachelors degree for the third time. How did your family’s financial crisis affect you? I decided to build my own consulting firm. I hadn’t even finished my MBA but my family was collapsing and there was a growing hole in my bank account. I also applied to get a PhD in Business at NYU and got accepted. My husband also applied to NYU and got accepted. During the first two years of my PhD I was in New York for half of every week and in Tel-Aviv the rest of the week. I eventually left my consulting business and stayed in New York. I was balancing a lot – I was getting my PhD, I was working for McKinsey and I also got pregnant. I was interested in how companies innovate. I wanted to study Pfizer and their drug development but there was a lot of internal restructuring in the company so my work would have been delayed if I focused my research on Pfizer. A colleague invited me to a meeting with the CEO of Benjamin Moore. On a whim, I joined the meeting and ended up studying Benjamin Moore and innovation in the paint industry. What attracted you to the subject of color? I knew nothing about color and a whole world opened up to me. I went to the library in 1997 and looked up the paint industry in a huge encyclopedia. There were only three pages on the paint industry. The first line said, “Color is in everything, and yet we know so little about it.” I remember thinking about that sentence for hours. I couldn’t come up with another example that fit that condition. What other thing is in everything, but that we know so little about? If color has such an impact on people and we don’t know a lot about it, I thought there was huge business potential. Now I have two businesses focused on color. What are those two businesses? Together with someone I met at Benjamin Moore, I started a consulting company, LH Color, specializing in the intersection of color and business. We went to conferences, did research in the field and became known in the industry. In 2007, the owner of the Color Association of the United States, a forecasting agency, gave us a call and asked if we were interested in buying her business. It was the premier organization in color management. We bought it and are now the owners of all of the certificates, notations, and data about all of the colors in all of the flags in the world, the colors used in Air Force One, and the exact shades that were in the clothes that historical figures wore, etc. What is the new business that you are working on now? I came up with the idea of creating a library of all of the colors in the world. I wanted to create Big Data for colors. We are doing analysis and compiling research on what colors are used in different ways and what colors are preferred. We are building a subscription service called Hue Group and it’s very exciting. We’re currently fundraising and looking to raise $1.5M. This color business is the first of its kind and it will help companies make better decisions. The right colors sell and the wrong colors do not. It unlocks a whole language that exists but that we aren’t so conscious of right now. A fuchsia/magenta kind of color. I like the warmth of it. It’s whimsical, warm and free-spirited. I feel at home with it. What did you learn about yourself throughout your career? None of this would have happened if I didn’t agree to go to the meeting with my colleague at Benjamin Moore. I was open to the opportunity. I could have created a career around Change Management. People are always asking me to speak and write books on the subject. There’s more certainty for me to become a Change Management guru. But I prefer to work on the subject of color even though I haven’t experienced a huge return yet. It’s a very risky choice. But it doesn’t feel risky to me. It feels more risky to do Change Management, which is so much more mainstream, conventional and boring. You’ve been teaching for 28 years. How have your students changed over the years? I don’t know if my students have changed, or if I have enabled something different to happen over the years. Because we live in an environment that affords so much more information than previously, the students now are very knowledgeable. I’m also a different teacher than I was years back. I’ve always put students on a long leash without much instruction and engaged in deep conversations. But now I have more to offer in conversation and now the students can participate on a higher level. So the discussions in the classroom have deepened and are extremely interesting. Throughout my career, I kept my independence and my voice. I think I’ve been successful because I’ve done things my way. Growing up in Tel-Aviv when I did was incredible because from a very early stage in my life I was independent, entrepreneurial and free-spirited. I’m grateful to the world that let me keep that. My environment and my mother let me be this way. I was born to the right mother, in the right country at the right time. It’s the most amazing coincidence. On a personal level, my mother and my grandmother, who was a Holocaust survivor. I also have a collection of leaders that I love. At the top of the list is Steve Jobs. I love his courage and he was a very smart person with tremendous insights. I’m an addict for smart people. Any interview that I’ve read with Steve Jobs has had more insights for me than speaking with 95% of my colleagues for 15 years. I’m not so ego-less to say that I don’t want a legacy, but I never have an answer to this. It’s as if it doesn’t matter. What has been very important to me is the ability and the permission to discover my own voice and learn to work with it. I have many more years to go because there’s a lot to explore and I’m really far from being done. For all I know, I could be the Prime Minister of Israel one day. I don’t think I’ve even hit 1/3 of my potential. I want to create something through which people can become more of who they are because of it. I attempt to do this through my teaching and with my kids. But more systemically, I want to make a societal impact. For example, the people that built Google did something tremendous for all of us. Steve Jobs, Mahatma Gandhi, Martin Luther King – these people enabled a zillion people after them to live life so much better. I am not going to die a second before I get to this place. Sally Tannen is the Director of the 92Y’s groundbreaking Parenting Center. She has helped grow a vibrant hub that supports over 2,000 families on the Upper East Side of New York City. She is a leader in the field of Early Childhood Education and shared her unique perspective with Forward Females. Take me through your career path from the beginning. How did you end up where you are today? I always knew that I wanted to work with kids. My mother was a nursery school teacher. After a few years of teaching post-college, I went to graduate school and got a Masters in Early Childhood Education. Back in the early ‘80s there was more flexibility in schools and the school I was in was very supportive of new moms. So I was able to take a year off after I had my daughter, and then I went back part-time for a few years until I was ready to return full-time. I became the Director of Admissions and stayed in that position for seven years. I moved to a more traditional school and became the head of the lower school. It wasn’t a great fit philosophically. I had very progressive roots and being there didn’t feel right. I switched to a different school and went back to doing admissions. After eight years, I started to get antsy and I felt like I had stopped growing. So I applied for the position of Director of the Parenting Center at the 92Y. I was very nervous about this role because I thought, “What do I know about babies?” It was a good personality match because I’m comfortable working with parents and kids. This is my 14th year at the Y. What are your goals in this role? The Y can be an impersonal place. It’s big and so many things are going on. When I started in this position, I felt strongly that I wanted to personalize the Parenting Center and make everyone feel welcome. I want parents to know that this is not just a place to take a class, but it’s a place to seek support, advice and friendships. You’ve been the Director of the 92Y’s Parenting Center for the past 14 years. What are some trends that you’ve noticed over the years? How are parents today different from parents 14 years ago? In some ways it’s changed a lot. In New York, more parents feel pressure to do more. There are also more challenges related to technology. Now there’s a ton of information out there. With more information, comes more confusion. Parents are struggling with where to go for advice and who to believe. As a result, parents don’t trust their instincts as much as they used to. More families in New York are living away from their parents. Many women move to New York for work, get married and end up starting families here while their parents are in a different continent. They don’t have built-in support. It takes a village to raise a child and it’s up to them to create their own village. More women are working so many parents today are enlisting caregivers to raise their children along with them. We feel very strongly at the Parenting Center that we want to support caregivers as much as possible. We started a program called Caregiver Connection where they have a network, they share songs, and we give them resources for things to do in New York. We let them talk about struggles that they’re dealing with and help them figure it out with their families. Today, parents are overscheduling their kids. Babies and children need downtime. They need unstructured time when they’re not being instructed. When they explore, play and pretend. And just be. Overscheduling is having a negative effect on children and parents don’t see it. Babies are going to two classes a day and that’s nuts. By the time these kids are two and three, they’re anxious because they’re constantly getting things thrown at them. What’s your advice to women who want to “have it all”? I don’t think there’s one answer. It’s what works for you. You also have to give yourself a break. It’s not possible to have it all. Get help when you can – from your parents, your neighbors, if you’re able to hire somebody, engage your partner. But you’re going to feel guilty no matter what you do. You just have to do the best you can, and that’s really good enough. I think parents impose so much on themselves without me having to say anything. I never want them to feel judged. You mostly work with mothers but what is your experience working with fathers? Certainly after 2008, there was a period when we saw lots of dads because they lost their jobs and were taking their babies to classes. We always see dads but right now there aren’t as many as there had been before. We have a program called Boot Camp for Dads and we have other opportunities for dads to come in – classes, conferences, etc. It’s now the norm for dads to spend more time with their kids. More businesses are family friendly and support fathers in the workplace. Years ago, fathers were embarrassed to put their child’s photo on their desk and now that’s definitely not the case. What has been your greatest career mistake? Previously working in a school that didn’t match me philosophically. You’ve got to go with your gut, but I was so focused on the opportunity to be a lower school head. Coming to the Y. It was a huge leap and a big learning curve. It still is and that’s why I love it. Every year I learn something new. In the beginning, I learned a lot about babies, toddlers and their behavior. This year, I worked on development because it’s the Parenting Center’s 35th anniversary. Over the years, I managed a larger staff. I’ve grown the Parenting Center’s offerings and I’m proud of that growth. My whole life has been in preparation for this job. Teaching, working with kids, parents and caregivers, having my own family – everything has come together and helped me navigate this. I couldn’t have done this earlier in my career. And I’m still constantly growing and that’s where I always want to be. Dr. Claresa Levetan is an endocrinologist and the Founder and Chief Scientific Officer at Perle Bioscience, a pharmaceutical research and development company, at the forefront of diabetes research. Can you share with me your career path from the beginning? How did you get to where you are today? If I connect the dots backwards, my mother had a best friend who had diabetes. I saw this woman who was once vibrant and healthy lose her limbs, go on dialysis, and become blind. When she passed away it had a big impact on me. Then my father got diabetes. This disease stuck in my mind. I also love art and I’ve been doing sculptures and collages since I was young. I approach science with a right brain perspective of taking odd things and putting them together like a picture. I went into Endocrinology, which for some people is a tough specialty with a lot of complexities. But for me, it just made sense. And diabetes is much more of an art than a science. Unlike other areas within Endocrinology like hyperthyroidism, which is treated with a thyroid hormone pill, or menopause, which is treated with an estrogen replacement, diabetes doesn’t have a perfect fit. In diabetes, you have a loss of cells that make insulin and another hormone embelin, but you also lose the islet cells that make hormones. Frederick Banting who discovered insulin enabled us to treat people with diabetes and consequently, patients lived who were previously destined to die. But they also became hypoglycemic [a condition characterized by abnormally low blood sugar levels] and gained weight. So we have this treatment called insulin, which saves people’s lives, but it’s not working as well as having functional islets. How would you explain your research at Perle Bioscience to a layperson? The body is a perfect machine and works intuitively. If something goes wrong, the body is going to try to fix it. If you injure the pancreas, as in diabetes, there are stem cells that can be turned on to help repair it. At Perle, we tried to figure out what those genes are so that ultimately we can give people a therapy by which they can generate their own new islets and insulin producing cells again. We’re working with the body to self-regulate, rather than simply injecting insulin. I’m mostly focused on patients with type 1 diabetes, people who predominantly get diabetes in childhood, because those are the patients that have dramatically shortened lifespans as a result of the disease. In those patients there are two problems: 1) there’s an autoimmune attack on the insulin producing cells and 2) there’s an inability to regenerate the cells. This population has the greatest need and there’s currently no other option than to be on insulin. What has the greatest obstacle been? Fundraising. When I used to work in academia as the Chief of Endocrinology at Drexel University in Philadelphia, I had two large NIH [National Institutes of Health] grants. Our path at Perle is very different because we’re raising money on our own, which gives us much more flexibility to do the research we want to do, and at our own pace – much faster than it would be in an academic lab. The downside is we need to raise the money. We’re not your typical Harvard lab. We’re trying to get our own funding and trying to run as fast as possible. This is a potentially transformative therapy. There are a lot of egos. Other researchers are working in silos. We have a different vision – our vision is bigger. We’re trying to take a different approach by completely redefining diabetes. What is it like being a woman in the industry? I’ll tell you one story. When we were raising money for Cure DM [Dr. Levetan’s first company preceding Perle Bioscience], we must have met with ten venture capital funds in San Francisco and the last morning our male investment banker had to fly home. The only VC we weren’t invited back to was the one in which our investment banker wasn’t at. I think it’s still a man’s world. You’re more successful raising money as a man than as a woman. My answer to that question has changed over the course of different points in my career. A few decades ago, I chaired a conference where Senator Susan Collins, who chairs the Senate Diabetes Caucus, and Newt Gingrich, who was the Speaker of the House, were involved. I helped the American College of Endocrinology and the American Diabetes Association set target goals for post meal sugars, which had never been done before. I helped standardize the names of A1C tests [a common blood test used to diagnose diabetes and then to gauge how well you’re managing your diabetes.] We hired Gallup to poll two doctors in every state and asked what name they used for this test and we got over 60 names from 100 doctors. We standardized the name to A1C and at the time that felt huge. When I lived in Washington, I met with several members of Congress who had children with type 1 diabetes. I was instrumental in creating a Congressional Diabetes Caucus. Now those are the two largest caucuses in the House and in the Senate. When Bill Clinton was president, I helped write the legislation for Medicare to reimburse patients for meters, strips and insulin pumps. I’m looking forward to the day when there are no more meters and strips. I’m looking forward to the day when diabetes is a disease of the past. One of the most fun days of my life was this past year when I recorded a diabetes song in Nashville with Adam Lasher, Carlos Santana’s nephew who was a finalist on American Idol, and Amanda Jo, both of whom have type 1 diabetes. I used to sing these diabetes songs to my kids in the car and when I got to record it I had a total blast. The first time I wrote a paper as a Fellow in Endocrinology I got rejected. I was shocked. I had to keep submitting it over and over. When the paper was finally accepted it felt almost as good as giving birth to a child. I get knocked down but I try to realize that it’s just part of the past. I’ve been able to keep going knowing that everything isn’t going to be perfect. Frederick Banting, the scientist who was the first person to use insulin on humans. He was also a painter. Hanging on my wall in my office are pictures of famous failures like Oprah Winfrey who was told she wasn’t fit for TV, and Michael Jordan who was cut three times from his high school basketball team. Patients who smile even though they are going through a tough time. I’m inspired by life. I have this opportunity to really help. I want everyone with diabetes to be off of insulin. I’m an eternal optimist and I believe that in 2016 we have the tools to reverse diabetes. And I’m planning to make sure that happens. Sarah Nadav is a tech entrepreneur based in Tel-Aviv. In an article that went viral, she shamed venture capitalists who discriminate against women. Now, she is on a mission to create more transparency in the field while also launching her most recent startup, Civilize. Take me through your career path from the beginning. I studied behavioral economics and my focus was on the environment – how to get people to recycle, for example. I founded a grassroots organization that brought plastic bottle recycling to Jerusalem. I did my Masters degree in Nonprofit Management. When I changed my career direction to the tech space, I realized I had learned a lot that translated to the for-profit field, such as managing a Board of Directors. I had a teaching position at Hebrew University and I considered myself a data scientist. I became interested in debt collection and how it worked. I thought the problem was clear: debt is turned into a financial product. Usually if something loses value, like an item of clothing, the price goes down for the consumer each time the product is resold. First it is priced at retail, then goes on sale and then it gets sold to discount retailers, like T.J. Maxx, and the price is even lower. But with debt it is the reverse, the price to buy debt goes down each time it is resold, but the cost for the person in debt goes up because the collection process is very expensive. This makes it harder for people to ever pay back the debt that they owe. I realized this issue needed a market solution – not a nonprofit solution. My first startup was not a success, but I am now working on my second startup, Civilize. Civilize is a communication platform that bypasses collection agencies. That’s valuable to banks and creditors since they want a direct line of communication with people in debt. This has global implications because we don’t give any financial advice. As the name states, we’re trying to make the collection of debt a more civilized process. I’m now part of Barclays Techstars Fintech Accelerator, which is a prestigious program designed to help entrepreneurs grow their businesses. How did you get funding? What was the process? Because I came from the nonprofit sector, fundraising was something I was very comfortable with. I did have a lot of problems though because the industry is incredibly sexist. Getting funding was a huge challenge because people loved my work, but couldn’t see me in the position of CEO since I was a woman. I created my startup before Lean In was written and before there was widespread awareness about the issues women in tech are facing. I felt very alone. It was much harder for me to raise money than it would have been for a man with the same company. I’m trying again and I think the timing is better now. Your article for Medium went viral. What instigated you to write this and publicly air your frustration with sexism in the field? I wrote this on a whim. I was just venting. I had already been accepted to the Barclays Accelerator. In addition to founding a startup, I was fighting sexism. I identify with women who really broke through the glass ceiling like Ruth Bader Ginsburg. These women were willing to speak out and push buttons. I wanted to be vocal about the struggles and limitations that I felt as a woman in tech. How did you feel about the article going viral? I was not prepared. It was incredibly shocking and overwhelming. I got an incredible global response – there were women from India, Nigeria, Silicon Valley, New York, and Europe who reached out to me. I never anticipated that. I thought the only thing that would happen as a result of the article was that this guy [a deal flow Manager for a major VC firm] would see I took screenshots of our conversation and he would get mad at me. Yes, but there’s nothing he can do about it. Besides for him, did you experience any backlash? I don’t feel any backlash in terms of consequences for my actions. The people that I angered are the worst perpetrators of the problem. I don’t have the time or patience for people who don’t want to fund women. I want them to not want to talk to me because I’d like to weed them out. It’s impossible for white men in positions of power to face themselves when it comes to issues of sexism and racism. Because then they’d have to question whether their success is only due to the game being rigged in their favor. These successful men are not in positions of power because they’re the smartest or most qualified; it’s because they’re privileged and others got shut out. They can’t handle that. The only negative response I got was from white guys who wanted to tell me that these problems don’t exist because they’ve only experienced complete equality. So you’ve become known for championing equal rights for women. Where do you go from here? I am deep into this Barclays Accelerator and working on my new startup. On the one hand, I want to be active in spearheading women’s rights. On the other hand, I think the best way to do that is to succeed in my work. I’m done with the women helping women in tech movement. I think we need to change the conversation. I used to be part of these mentorship programs where I helped women pitch better and present themselves with more confidence, etc. But I want to be more involved in helping men because they are the problem. I don’t know how to do that but the movement has to switch from women supporting other women to women shifting the mindset of men. I don’t want any more victim-blaming. Women don’t need to get better and prove themselves. Men need to prove themselves. I want to be involved and active in ways that hold men accountable. I want more transparency. If a fund is exclusively putting money toward young white men, I want that fund to be called the Young White Men Fund. I also think there are a lot of women who have a lot of money and don’t cut checks. Even women who grew up with the feminist movement are not funding women-led startups. What is your relationship like with other women in the industry? I am part of a sisterhood of women where we are all in this together. Getting startup funding is not an either/or. It’s not as if either someone will fund my company or her’s. Women are constantly helping each other, boosting each other, making important introductions, writing about each other in the press, and warning each other about men who are sexist. There are so many of them! It’s true that with a startup you fail often, fast and hard. My first cofounder was my biggest mistake. He was incredibly talented, but he wasn’t fully committed. Ultimately, it was up to me to fundraise. He was the hoodie-wearing tech guy that people want to fund. If he had been the one hustling and asking for money, we would have gotten the funding we needed. I’ve learned from that mistake. Now, with my second startup I’m investing in teambuilding and creating a company culture of deep commitment. I am very proud that I got invited to the World Economic Forum. Knowing what I know now, I’m proud that when I first started pitching my startup that I did succeed in getting investment. At the time, women only got 2.7% of all VC investment. 97.3% of all investment went to male CEOs. I’m also really proud that I never gave up. When citing that statistic, shouldn’t we take into consideration the percentage of startups that are founded by men? No. Women found 40% of all businesses. So many smart and competent women can’t get funded. And there’s a cycle – if women get shut out of getting funding to begin with, they can’t become successful and they can’t become investors. Women investors are three times more likely to fund women-led startups than men. Women can pitch the same company with the exact same presentation materials and get funded 40% less than a man presenting the identical thing. Despite these odds, I did succeed in getting funding. I have two sons who are 9 and 11. When I was pregnant with my youngest I had a two year old. At that time, my husband was diagnosed with a brain tumor. That experience got us into debt, which led to my interest in the debt market. It pushed me to have a career when I had never been ambitious. I suddenly had to support our family and I decided it was time to get ambitious. I wanted to provide the best life possible for our kids. It transformed everything in my life. Brené Brown, Ruth Bader Ginsberg and Dorothy Parker. I want my legacy to be having a really disruptive impact on financial markets. I want to be a woman who has pushed the envelope in the finance world. Susan McPherson is a trailblazer in the field of corporate social responsibility, culminating in the founding of her consulting firm McPherson Strategies. She is also an angel investor in women-led technology startups. She spoke candidly about her career path, her work with refugees and the importance of empathy. Wow. I’ve had nine lives at this point in time, but there was always one trajectory through all of the different careers that I had and that was volunteerism and giving back. Even when I was working in corporate jobs, I was always fundraising on the side and serving on non-profit boards. My first job out of graduate school was working on the editorial side of USA Today. Then I moved to the marketing side of the company because I liked to write but I soon realized that I didn’t have the passion to be a reporter. After that, I joined PRNewswire in 1989 and was with them until 1997. I left PRNewswire for five years and was working in the technology space doing business development and partnership creation. In 2002 I went back to PRNewswire and was there until 2010. My last role at PRNewswire was creating products and services for people doing corporate social responsibility and social impact. So that role propelled me into the social good space and I knew who the major players were, what the big conferences were and who the leading thinkers were. That is when I started to gain my passion for this work and I saw the way that business could be a force for social good. Bpeace’s DOSTI Soccer Ball Story: Soccer balls as a means to financial independence for Afghan women. In 2006 I joined the Board of Bpeace, which helps women entrepreneurs in regions of conflict grow and strengthen their small businesses. As a Board member I visited Afghanistan and got to know this world I had never known. When I went to Fenton, my job was to create a corporate practice. Historically, Fenton had always been a consultancy that served NGOs and advocacy groups. Over 3 ½ years I built Fenton’s corporate practice and brought in clients like Unilever, Kate Spade, Toyota Foundation and Avon. It was very exciting. When I was there I founded #CSRChat on Twitter which is now continuing six years later. In October 2013 I decided to go out on my own and start McPherson Strategies. I did not have the intent to start a consultancy. However, a couple of organizations said they would hire me and it was enough to pay the mortgage. It’s been 2 ½ years since I started McPherson Strategies. Today we have clients that include J.C. Penney, Tiffany & Co. Foundation, a social enterprise called The Lucky Iron Fish, the Brooklyn LAB Charter School, and Tonya Lewis Lee, the wife of Spike Lee who is pushing for better healthcare for marginalized populations. I serve on the Board for USA for UNHCR, the UN Refugee Agency and PVBLIC Foundation, which is about amplifying campaigns for social good. How long have you been investing in women-led tech start-ups? Five years ago I learned that only 5% of venture capital in this county goes to women-led startups, which is horrific. It means we will never gain equality – whether it’s hourly wages or seats in the boardroom – if we don’t have women successfully founding businesses. I’m not putting kids through college so I decided in the same way I used to write checks to help various causes I can also help women reach their dreams. I can support women who are launching businesses and maybe I can get a return on the investments, but even if I don’t, most importantly, they are creating jobs, which is a social good. Whether I believe in the founder. Yes, I should be looking at all of the finances and checking the revenue models. But when push comes to shove it’s really the individual and whether I believe in her and care for her. Can you give me any examples of women you’ve supported and why? When Jane Barrat prepared to launch GoldBean, a financial-technology platform for those that are unbanked or lack a strong knowledge of investing, her unique background in advertising and marketing immediately drew my interest. When Katheryn Minshew and Alex Cavoulacos explained The Muse‘s model and market, I was completely blown away by their knowledge and enthusiasm. When I tasted Hint Water and listened to Kara Goldin espouse the amount of sugar and additives in almost everything we put in our bodies, I couldn’t wait to step up to the plate. When Lisa Witter and Robyn Scott announced their intent to launch Apolitical, given their respective track records and experiences, I was sold immediately. Staying at PRNewswire too long. I was fearful of what was out there. It’s a problem many people face when they stay at a company for a while. You don’t know what you don’t know and you’re terrified of what you don’t know. I could have been further along if I left earlier. Building my own business and being recruited and selected to join the USA for UNHCR Board. In the middle of the refugee crisis I am doing my part to help out. For my birthday last fall, I raised over $30,000 directly to fight the global refugee crisis. During the year, I speak and advocate on a regular basis (at conferences, in classrooms, etc.) to educate people on the plight of refugees. The situation is so beyond human proportions but I have to believe that by advocating and raising money for these people, it’s going to help in the long run. At the absolute top, First Lady Michelle Obama is a guiding light. I hate to think that she’s going to be out of the public eye. I hope she goes on to do something else so we continue to see her. Sylvia Earle, a marine biologist who is 80 years old and still dives 100 days a year. She is an advocate for our planet. Gloria Steinem and the other early leaders of feminism. We wouldn’t be where we are today if it wasn’t for their leadership. Ruth Ann Harnisch, a philanthropist who I just adore and respect. She funds a lot of causes to ensure that there are equal voices in public dialogue. Lisa Witter who just started a business that I funded called Apolitical. Cindy Gallop who is an entrepreneur and a huge supporter of women. Jacqueline Novogratz who founded Acumen. And my late mom, Beryl Stern Spector. How did your mom inspire you? My mom went back to work when I was six. So I was one of the original latch key kids in the ’70s. I remember resenting it because all of my friends’ mothers were there when they came home from school but I would come home to an empty house. Once I became a teenager, I learned that she was doing amazing work. She was doing PR for PBS and she was traveling a lot. I started to realize that she was a rock star and a role model. She was known as one of the most compassionate and caring women you’d ever meet. And plenty of people said that besides her daughter. Sadly, my mother’s death. She was killed in a hotel fire. When it happened and for a few years after it happened, I was in a state of shock. But today I can see that I’ve tried to continue her legacy through the work that I’ve done – whether consciously or subconsciously. I always think what would she do? Maybe because I’m in a similar field to the one she was in, but also because I admired her ability to connect with people. If she was doing PR using a typewriter and a telephone, I can only imagine what she could have accomplished with the Internet, a smartphone and social media. She had such a capacity to build connections. That’s a quality I pride myself on. I always call myself a serial connector and there’s nothing that brings me more joy. Because I lost her when I was young, I feel that by living like her I am able to live with her. In a mystical way I still have her by my side. Based on where you sit in the field, what do you think is the greatest issue or obstacle facing women today? The notion of getting funding is hugely important. The second obstacle is confidence. I’m sure the two can be interlinked. Women have to keep propping each other up because insecurity is common and it holds people back. Women need to stick together and support each other in the trenches, always. I really tried throughout my life to not only give back but to be filled with empathy. I believe partly what is coming around for me today is because I’ve always been willing to help and meet with people. There is a school of thought that says if you do, you’ll never get your work done. But there’s another school of thought, specifically there’s a professor at Wharton named Adam Grant, who says the more you meet with people the more successful you will become. I believe in what he stipulates. The reason my business is doing so well and clients continue to come to us is that I have chosen this path. I am not trying to come across as a nun. I certainly have my days and swear with the rest of them. But there is something about truly caring about other people and following up when people ask for help.